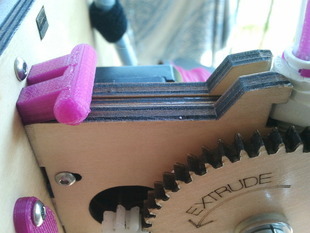 When I pushed the filament manually, I had to prevent the feeder from popping out of its attachment slots. I designed this thing to make my life easier. Interestingly, it is also one quite popular object on thingiverse, so there must be a lot of people annoyed with this attachment (and because of failure with the hobbed bolt). Actually I almost never had to push the filament manually anymore, but this is due to my new and own filament feeder design.